This afternoon, I went to a ‘Workshop for Humans’ with Alex Bailey & Krõõt Juurak – after they came in yesterday afternoon to give a private performance for Barney (our border terrier). The performance – with a local agency news photographer present (you can see the video here) – was really interesting for Barney’s Humans (us) – and he definitely enjoyed aspects of it (as well as being a bit unnerved by others!). As someone who doesn’t ‘do’ movement work – I found the workshop today really interesting, in trying to get a ‘felt sense’ of our favourite animals, not through words, but through movement (the animals’ ‘language’). I particularly enjoyed the ‘imprinting’ activity of having one’s limbs manipulated by others, holding in mind particular animals – a curious experience, and oddly, rather nice not to be in charge of my own body, for a bit. One of the activities during session was apparently an old ‘personality test’ – the results of which I thought I’d share here. Giraffe: elegant; clumsy; amazing run. Then we were told that – according to this old test – the first represents what we want to be (elegant, clumsy, amazing run), the second how others see us (intelligent, odd, scary) and the third who we really are (loyal, playful, expressive). Why ‘Could Be The Moon’? Well then: new year, new website. And a new name for my (un)creative writing & facilitating endeavours. But why ‘Could Be The Moon’? As the Henry Moore Institute put it: “Play and joy occupy crucial roles for Filliou, who believed art making was part of a permanent, universal and endless process deeply embedded in everyday life”. So here’s to play, joy, and the permanent, universal and endless process in 2015: could be…who knows…. (yes, that’s a West Side Story reference). Two of my poems – as well as an array of splendid work – are in this edition of Eyedrum Periodically, on the theme of ‘Backwards’. Of my two: one poem relates to upside-down art (or does it? ); the other to topsy-turvy time (or does it?). OK, I’ll stop that now (or will I?). Yes, I will. I hope you enjoy all the work included – looking forward to reading everyone’s work in the publication. So we made an ekphrastic call-and-response poem, using one of Wenzel’s pictures as stimulus. The idea is that one of you writes 4 questions while the other – without seeing – writes 4 statements, then you do the same but writing the other type of sentence. So you have eight of both. After that, you read them out and listen out for interesting mismatches, dissonances and combinations. The vase is filled with another thousand of these moments. From where did she get that vase? It is often seen here, baying in the corner of this café. Is that one piece of fabric? That floor is a psychedelic million checker-board war zone. Tangerines all begin this way. When it is done, what will be left? What is the angle of its knees, the degree of curvature in the spine? There is tension and balance. Is it staying, laying, roosting, or is it passing through? The toe nails are painted on the shoes. 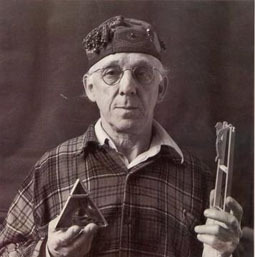 Ivor Cutler, January 15, 1923 – March 3, 2006. For a while now I’ve wanted to write and perform something as – channelling, or in tribute to – Ivor Cutler. I was introduced to him some years ago and love the slowness, darkness and ambient-intensity of a lot of his poetry – and songs. And how inexplicably hilarious (while worrying) they are. He and poet Phyllis King jointly appeared in the BBC programme ‘King Cutler’ – where silence (not awkward, more wilful and full of potential) played a vital part in every programme. If you can find them online, listen to them (there’s an instruction, more on them shortly). A friend recently showed me a poem by W D Cocker – The Bogle and the Bour-Tree – which you can read here, on the Scottish Poetry Library website – a favourite of hers. Having visited the Manchester Art Gallery’s exhibition ‘do it’ 2013 last week (information here) which is now in its 20th year of artists giving instructions, as art. I decided to write a response to The Bogle, as a set of instructions by, or channelling, Ivor Cutler. They instruct what to do to avoid/overcome/’process’ the Bogle. To read my tribute, you need to imagine yourself into Cutler’s voice – so I suggest having a listen to this, first (and any other poems you find on YouTube). It’s Cutler giving his insight into bread (and) butter. than your idiot unconscious and dreams about paper-clips. Go, if you will, down the stairs – avoiding that third one that creaks. You should fix that. One weekend. You don’t want him to hear. those expensive halogen lights. You don’t want him to see you coming. chrome and modern. That sounds about right, for you. Now, rummage – right at the back. The vaults. Don’t put the lights on, like I said. Grab three cans. An all-day-breakfast. Some fetid kidney beans. Whatever. Don’t look what they are. Just tear off their labels, leaving them plain silver. Don’t open them. Not yet. The next part is important – and difficult. Now: juggle the tins. For at least a minute. You may think it silly. I know you much prefer ‘juggling’ Excel. But the Bogle can tell, from the smell. is up to you. Open each can. Pour their contents out. The un-fresher, the better. Not just into anything: make it your finest, fanciest dish. You must have one. When the Bogle is found, it will judge you on the sound. passed out in that disgusting tie again – go into the murk, to your local Bour-tree. Do not use Google Maps for this; however much you adore your iPhone 8. The Bogle disapproves. You will know the tree, when you see it, by the shape. This is best, by the way, not at dawn, but just before. The Bogle, it is little known, is crepuscular. Approach the tree confidently, yet calmly. Treat it like your weekly Wednesday meeting. I am no wee wean. I have nae dreid. This offering I put upon the Bogle’s heed. Beneath this Bour-Tree’s bowers – ever agin’! and stamp around the tree three times, repeating the rhyme. and you’ll find you can enjoy your walk to work once again. This is part of a series of artist’s sound art interventions on Radio 4, called Open Air. I happened to hear this when it was on and thought it was wonderful and disconcerting moment of radio. It wasn’t introduced or given explanation, it just launched into a disjointed mash-up of Radio 4 voices.